It’s a warm evening in west Clare. Half an hour ago, I was handed the keys to a Trident holiday home at Lisdoonvarna Village. I dumped my bags, went for a wander around town and, lo and behold, chanced into this little pub/restaurant/JM Synge play-come-to-life. A full 13-and-a-half audio minutes later, Curtin’s anecdote is still circling the airport. (His Swedish-born wife Birgitta later laughs that she could have related the entire sceal in 30 seconds flat.) But he’s getting to the point. Apparently, in the late 1940s, and early 1950s, JRR Tolkien was employed as an external examiner 40 miles from here at University College Galway. “Do you follow me?” he asks. Well, it sounds like the tallest of pub tales to me, but Curtin has the research to back it up. And, just this May, the Tolkien Burren Society held their first summer festival. The Roadside Tavern is an easy place to lose track of an hour or three. In the end, we almost miss our dinner reservation at the Wild Honey Inn. Aidan McGrath, a fellow Mayoman, is the renowned chef here and I’m probably too much of a culinary philistine to do justice to the food he puts in front of us. I order steak. It tastes delicious. Let’s just leave it at that. Back at Rancho Relaxo the following morning, the red eyes of Sauron are blinking at me from the other side of the bathroom mirror. Holiday homes are one of the cheapest and most comfortable ways to vacation in Ireland. But Trident Holiday Homes are putting us up for the weekend in Lisdoonvarna, so I’d better say some more nice things about them than just that. Where to start? Well, this three-bedroom house is nicer than where I live. (True!) Trident is not affiliated with the people who make the Trident missiles. (I checked!) They have affordable homes to rent at 70 choice locations nationwide. (Blah, blah, blah.) Also, there’s no Wi-Fi here, but that’s a relatively minor gripe. This morning I’m heading deep into Tolkien’s (alleged) fairyland with Tony Kirby of Heart of Burren Walks. Tony is an encyclopaedia of Burren-related knowledge and, to judge from his TripAdvisor review page, he has an online fan base to rival that of Justin Bieber. While we walk and talk, the former civil servant offers a fascinating explanation of how the exposed landscape of the Burren was shaped by both natural (glaciers) and human (over-farming by our prehistoric ancestor) factors, over thousands of years. He talks about the area’s unique flora and fauna: 30 of Ireland’s 32 butterfly species reside here, along with 71 of our 73 frog species. He points out fly orchids and bee orchids: plants whose flowers have evolved over billions of years to resemble indigenous insects. By noon, I’m standing on the pier at Doolin waiting for a ferry that will take myself and 71 other passengers – mostly seasick French pensioners, as it turns out – out to gawk at the Cliffs of Moher. While I scan the horizon for our vessel, I chat to Joan Reilly, a self-proclaimed “dulchie” – or Dubliner who has seen the light and moved west. She now works as marketing manager for Doolin2Aran Ferries. Joan introduces me to the town’s most famous visitor, Dusty the Doolin Dolphin, who swims with children, frolics with fishermen and performs just about every tourist-friendly trick you can think of, bar coming up on the pier and signing autographs. If Dusty’s shtick sounds a little familiar – hello, Funghi? – in her defence, she does boast a bizarre origin myth worthy of a comic-book superhero. I’m told that when Dusty Springfield died in 1999, the singer’s ashes were scattered from the cliffs here. Shortly thereafter, our bottle-nosed friend rose from the water below – mystic, wonderful – and into the realms of local tourist folklore. Reincarnated as a dolphin? Oh Dusty, what have you done to deserve this? Half an hour later, we’re on the Doolin2Aran ferry deck chugging around the base of Europe’s tallest and most spectacular sea cliffs. 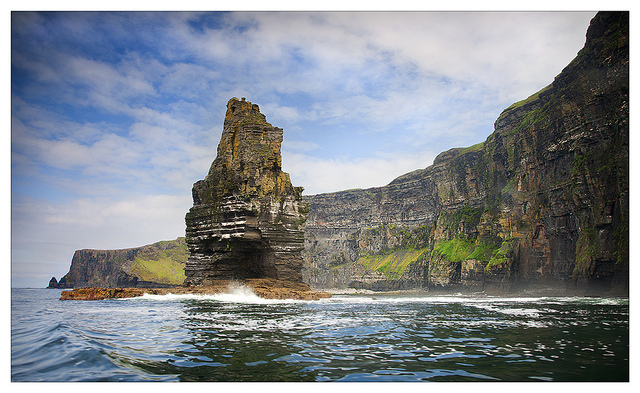 The trip costs €20 – a fiver less if you book online – and is only recommended if you have the stomach for rough seas. We get in close to the Bhreannan Mor sea stack, where tens of thousands of guillemots are stacked on the ledges above us like old ladies waiting for a bus. It’s a truly wondrous sight. Meanwhile, just as many puffins bob about on the waves below, as though the puffin Titanic has just sank and they’re waiting to be rescued. Unfortunately, this is a trip that will test the sea legs of inexperienced sailors. The last time I visited the Cliffs of Moher, I lay down on the grass above peering over the ledge down. This time, I’m 702 feet beneath staring up at the same precipice. There is something about the majesty of these rocks, it seems, that is nausea-inducing however I approach them. Next on today’s agenda, I’m supposed to be visiting the northern hemisphere’s largest stalactite at Doolin Cave. But the space inside the cave sounds pretty confined – certainly compared to the Aillwee Caves nearby at Ballyvaughan. I’m not fond of enclosed spaces and still feel very queasy from being tossed around on the high seas. No, I have a better idea. Earlier this morning, Tony Kirby called the lopsided limestone mountain at Mullaghmore the “tabernacle of the Burren”. But as far as I’m concerned, that accolade belongs to somewhere else. The Roadside Tavern’s calling me. As the ferry heads back toward Doolin pier, Joan Reilly asks if I’ll be hanging around in Lisdoonvarna long enough to catch the famous matchmaking festival there? When is it on, I ask? I just might, Joan. I just might. [N.B. After this was published, I had an email from a gentleman saying that the Cliffs of Moher aren’t the highest cliffs in Europe. Some place up in Donegal is. Well, I’m not taking sides on that one.